Jean Jenkins (1922-1990) was the first curator of the Horniman's musical instrument collection, and had a lasting influence on the development of the institution. Raised in Arkansas, she studied anthropology and musicology in Missouri. A tireless campaigner for black rights in trade unions, she was on the wanted list during the McCarthy era (1950-1956) of purges against suspected communist sympathisers. By then, she had left the USA and continued her studies at the School of Oriental and African Studies in London. Jenkins joined the staff of the Horniman in 1954. Her fieldwork brought a wealth of musical instruments to the Horniman and many fascinating recordings, a number of which were published. Her original tapes, musical instrument collection and photographic archive were bequeathed to the National Museums of Scotland. 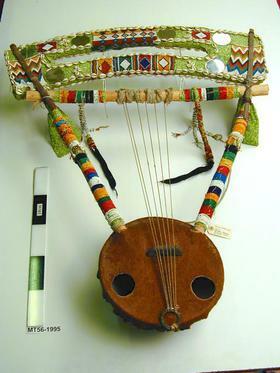 The advent of portable and inexpensive recording equipment changed the face of ethnomusicology and collecting. Jenkins' work increased public awareness of the marvels of traditional music from Asia and Africa, at a time when such arts were scarcely known in the West, and helped to foster the current taste for World Music and provide a documentary record of musical traditions that have disappeared or changed beyond recognition. She travelled to most of the countries in the world where Islam was practiced as the state religion or which had come under its influence in the past, from Southern Italy to China. Besides the musical instrument collection, her work on this project also resulted in a series of 6 LP recordings of the musical traditions from different cultural areas.